Your favourite wardrobe items come with clothing tags and mysterious symbols, but what do they mean? Clothing symbols can be confusing, but it’s well worth getting it right as these guidelines tell you how to clean your clothes the right way. To keep your clothes in good condition for longer, you’ll want to understand what those sometimes puzzling symbols on your tags mean. 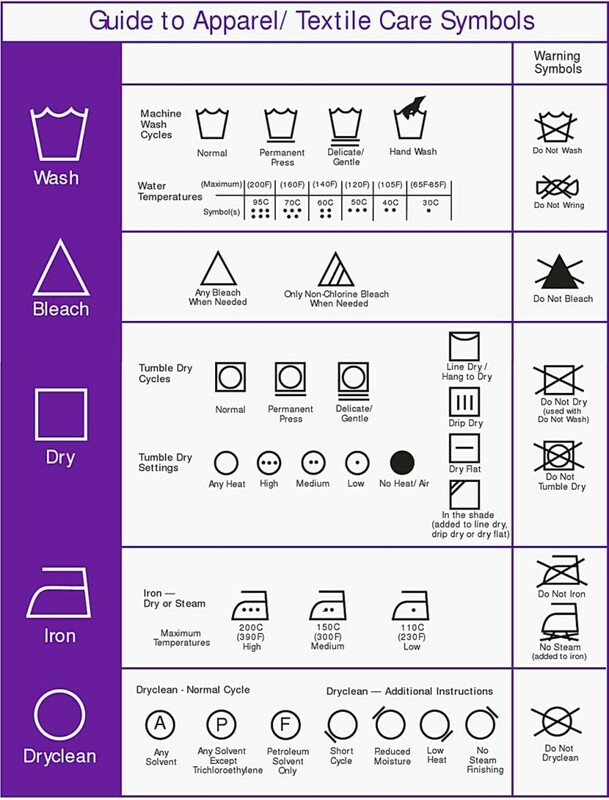 Use this complete guide to help you interpret washing symbols. Along with using the right type and amount of detergent, picking the right washing cycle on your machine is vital for avoiding damage, shrinkage, or discolouration when cleaning your apparel. Normal – The bucket filled with water tells you it’s okay to use a normal wash cycle. Permanent press – The permanent press symbol is a full bucket with a line underneath. This tells you the fabric has been treated with chemicals to prevent wrinkles and protect the original shape. If you see this symbol, avoid ironing the item. Delicate/gentle – The delicate/gentle symbol has two lines running under a full bucket. If you have this symbol on your tag, it’s probably a wool, silk, or other type of delicate, so always use the delicate or gentle cycle on your machine. Hand wash – If there’s a hand insider or above a full bucket, always hand wash and never machine wash. Use a hand-wash-friendly detergent. Temperature – The dots inside the bucket for any of the above symbols give you information about the maximum temperature for the wash cycle. One dot represents 30 degrees Celsius, two dots means 40 degrees Celsius, and three dots 50 degrees Celsius. Four dots means you can wash at up to 60 degrees Celsius, five dots at 70 degrees Celsius, and six dots at 95 degrees Celsius. Some tags have a number inside the bucket instead of dots. This number is the maximum allowable temperature. Do not wash – If a full bucket is crossed out, never machine or hand wash the item. The item likely can only be dry cleaned. Do not wring – If there’s a crossed-out wring symbol, never hand wring the item to squeeze out water. The bleach symbol is a triangle. If this appears on the tag, you can use bleach as needed on the clothing item. Non-chlorine bleach only – If there’s a bleach symbol with two diagonal lines inside, this means you should use only non-chlorine bleach, as needed. Do not bleach – A filled-in triangle that’s crossed out means you should never use bleach on that clothing item. An empty square represents the drying symbol. Different variations of this will tell you the best way to dry your clothing item. Normal tumble dry – A circle inside the square means it’s okay to use the normal tumble dry cycle. Permanent press dry – A normal tumble dry symbol with a line underneath it means you should use the permanent press dry cycle. Delicate/gentle dry – If there are two lines under the circle inside a square, you should use the delicate/gentle dry cycle. Heat setting – You might have dots inside the circle for the above symbols. No dots means any heat setting is fine, while a coloured in (black) dots means you should only use the No Heat or Air Dry setting. One dot means to use the low heat setting, while two dots recommends the medium heat setting. Three dots means it’s okay to use the high heat setting. Line dry – A square with a curved line at the top means you should hang it to dry or line dry it. Drip dry – The square with three vertical lines inside it means the item should be drip dried. Dry flat – If the square has a horizontal line inside, it means the item should be laid flat for drying. In the shade – If the square has two diagonal lines in the upper-left corner, it should be dried in the shade, whether line, drip, or flat drying is recommended. Do not dry – The crossed-out square usually comes with the Do Not Wash symbol and it means you shouldn’t dry the item. Do not tumble dry – The crossed out Normal Tumble Dry symbol means you should never tumble dry the item. The iron symbol tells you it’s fine to iron the item, whether it’s dry or steam ironing. High temperature – Three dots inside the iron symbol means it’s okay to iron the item at a heat setting of up to 200 degree Celsius. Medium heat – Two dots inside the iron means it’s fine to iron your clothing item at temperatures up to 150 degrees Celsius. Low heat – One dot inside the iron means it’s okay to iron at up to 110 degrees Celsius. No steam – A crossed-out iron with steam coming out under it means you should avoid using the steam setting while ironing. Do not iron – A crossed-out iron symbol means you shouldn’t iron the item. The circle tells you dry cleaning is recommended for the item. Any solvent – An A inside the circle means you can have the item dry cleaned on a normal cycle using any solvent. No Trichloroethylene – A P inside the circle means dry cleaning on a normal cycle with any solvent except for Trichloroethylene. Petroleum solvent only – An F inside the circle means normal-cycle dry cleaning with petroleum solvents only. Short cycle – A circle with a line in the bottom-left corner means to dry clean on a short cycle. Reduced moisture – If the line is in the top-left corner, dry clean on a reduced-moisture cycle. Low heat – A line in the bottom-right corner means dry clean on a low-heat cycle. No steam finishing – A line in the top-right corner means no steam finishing should be used. No dry clean – The crossed-out circle means you should not have the item dry cleaned. Clothing tags often come with a range of confusing care symbols, but if you get these top four types of symbols right, you can decipher what the most common symbols mean and likely avoid damaging your clothes. By using the right cleaning products as well as the recommended wash and drying methods, you can keep your apparel in excellent condition for longer. bio-home is a leading manufacturer of eco-friendly, 100% plant-based laundry products that allow you to achieve a great clean while protecting your family from harmful chemicals. Find out more about our natural laundry detergent, or contact us today for more information. Now you’ll never ruin your laundry again, especially if you’re kept fully informed by our Complete Guide to Laundry here.